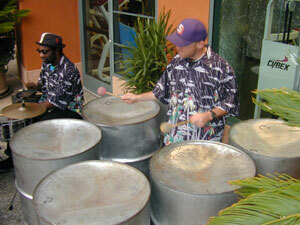 Pan Players are percussionist that play music on instruments called 'pan'. Originally made from 55 gallon drums and other types of containers in Trinidad. It became a musical craze in America in the early 60's. Still going strong today. 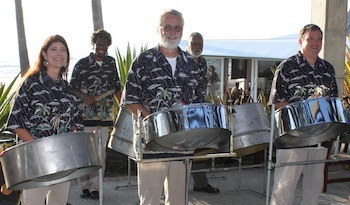 This site features Bill Harris and his band "Salsa Steel". Also is designed to allow everyone to experience the music of the pan. See how it is made, played and the people inspired to keep it all happening. Enjoy!! Salsa Steel gone electric with vocals, keyboard, & guitar. Bill Harris lead vocals, keyboard, & tenor pan; Stephanie Harris vocals & double second pan; Carlos De La Paz guitar; Kevin Cooper bass; Toby Ahrens drums. 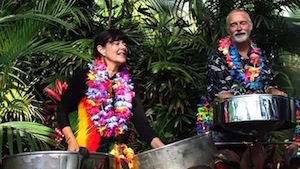 Songlist includes lots of Jimmy Buffet mixed with Bob Marley, Harry Belafonte. Also, plenty conga line/limbo favorites including Hot, Hot, Hot and Limbo Rock. Audio Recorded Aug.16th, 2014 at Dana Point Yaught Club by Stuart Holmes. Bill and Stephanie do lot's of variety. 1st call duo that plays steel drums or marimba and woodwinds. Acoustic or electric with vocals. 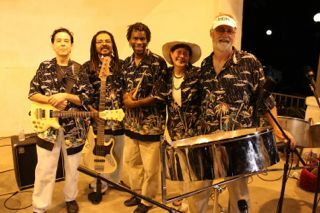 Salsasteel with Caribbean Gems Eddie Olive, Joy Martin and a friend are the dancers The band is Bill Harris tenor, Carl 'Papa' Lawrence double tenors, Cecil McBee Jr. bass, Mark Lamson drums and Tommy Aros Percussion. 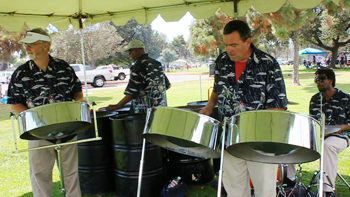 Five piece steel drum band at Claire's party on Del Mar Beach. Bill Harris-tenor pan/vocals, Stephanie Harris-woodwinds/vocals, and Cecil McBee, Jr.-bass guitar/vocals perform Sonora, Besame Mucho, & Sugar Bum Bum in Del Mar. This web site shows a variety of music featuring Stephanie Gudeman. Recording engineer and composer for the group Night Orchestra and other specialty theme and historical entertainment groups. 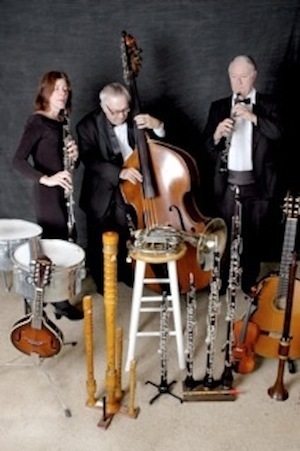 A vast variety of musical shows: Medieval, Renaissance, Victorian, Irish, jazz, rock, classical, or original pieces. Includes Bill playing drum set with an Irish band and other fun stuff. 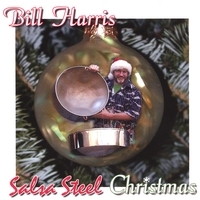 Link to CD Baby where you can listen to excepts and purchase 'Salsa Steel Christmas'. Bill Harris played the lead tenor pan, triple seconds, vibes and marimba, Allan Phillips played keyboards and percussion, Carlos De La Paz the guitar, Cecil Mcbee Jr. played electric bass, and Cliff Almond did the drums. 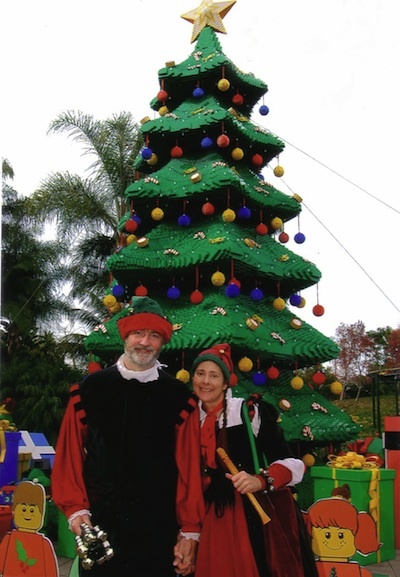 Marimba and recorder, acoustic Christmas duo with Dickens costumes. 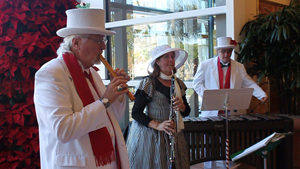 Bill plays tenor pan and Stephanie plays double seconds, Cecil McBee, Jr. on bass, Allan Phillips on drums at the Solana Beach Christmas 2014 Celebration.